Howard Dean recently criticized Gov Scott Walker for never finishing college, stating that he was “unknowledgeable.” What would your response be on college as a requirement for elected office? Back in 1990, The QVC Cable Shopping Channel was conducting a national talent search. I had no qualifications to speak of, but I needed a job, and thought TV might be a fun way to pay the bills. So I showed up at The Marriott in downtown Baltimore with a few hundred other hopefuls, and waited for a chance to audition. When it was my turn, the elevator took me to the top floor, where a man no expression led me into a suite and asked me to take a seat behind a large desk. Across from the desk, there was a camera on a tripod. On the desk was a digital timer with an LED display. I took a seat as the man clipped a microphone on my shirt and explained the situation. I looked at the pencil. It was yellow. It had a point on one end, and an eraser on the other. On the side were the words, Dixon Ticonderoga Number 2 SOFT. I opined about handmade craftsmanship and American made quality. I talked about the feel of real wood. After all that, there was still five minutes on the timer. 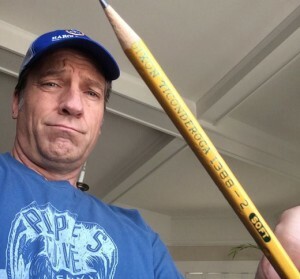 So I shifted gears and considered the pencil’s impact on Western Civilization. I spoke of Picasso and Van Gogh, and their hundreds of priceless drawings – all done in pencil. I talked about Einstein and Hawking, and their many complicated theories and theorems – all done in pencil. I spent three months on the graveyard shift, five nights a week. Technically, this was my training period, which was curious, given the conspicuous absence of supervision, or anything that could be confused with actual instruction. Every few minutes a stagehand would bring me another mysterious “must have item,” which I’d blather about nonsensically until it was whisked away and replaced with something no less baffling. In this way, I slowly uncovered the mysteries of my job, and forged a tenuous relationship with an audience of chronic insomniacs and narcoleptic lonely-hearts. It was a crucible of confusion and ambiguity, and in hindsight, the best training I ever had. Which brings me to the point of your question, Kyle. I don’t agree with Howard Dean – not at all. Here’s what I didn’t understand 25 years ago. QVC had a serious recruiting problem. Qualified candidates were applying in droves, but failing miserably on the air. Polished salespeople with proven track records were awkward on TV. Professional actors with extensive credits couldn’t be themselves on camera. And seasoned hosts who understood live television had no experience hawking products. So eventually, QVC hit the reset button. They stopped looking for “qualified” people, and started looking for anyone who could talk about a pencil for eight minutes. QVC had confused qualifications with competency. Perhaps America has done something similar? Look at how we hire help – it’s not so different than how we elect leaders. We search for work ethic on resumes. We look for intelligence in test scores. We search for character in references. And of course, we look at a four-year diploma as though it might actually tell us something about common-sense and leadership. Obviously, we need a bit more from our elected officials than the instincts of a home shopping host, but the business of determining what those “qualifications” are is completely up to us. We get to decide what matters most. We get to decide if a college degree or military service is somehow determinative. We get to decide if Howard Dean is correct. Anyone familiar with my foundation knows my position. I think a trillion dollars of student loans and a massive skills gap are precisely what happens to a society that actively promotes one form of education as the best course for the most people. I think the stigmas and stereotypes that keep so many people from pursuing a truly useful skill, begin with the mistaken belief that a four-year degree is somehow superior to all other forms of learning. And I think that making elected office contingent on a college degree is maybe the worst idea I’ve ever heard. But of course, Howard Dean is not the real problem. He’s just one guy. And he’s absolutely right when he says that many others will judge Scott Walker for not finishing college. That’s the real problem. However – when Howard Dean called the Governor “unknowledgeable,” he rolled out more than a stereotype. He rolled a pencil across the desk, and gave Scott Walker eight minutes to knock it out of the park. It’ll be fun to see if he does. Washington state, I was able to retire at 57 1/2. I still work for my previous employer conducting outreach events at high schools and career fairs throughout the Northwest on a part-time basis, because I know the importance of what a good career can be and all without a college degree. better than ours over the past 15 years. First I should mention that I’ve liked some of the things you’ve written in the past, although we don’t agree on other things. I also agree that a university education is not for everyone. People have different interests and aptitudes. It totally makes sense that some will opt for a tech college, apprenticeship, or on-the-job training. The important thing is to have opportunity and to maintain a strong university system. America is experiencing increasing competition from other countries in jobs, health and education. While the economic crash hurt many places worse than the US, we can’t count on that fact to sustain us in the future. What is very real is the growing gap between rich and poor. One way or another, our politicians need to make decisions which increase employment, especially jobs that pay decently, have benefits and are not so likely to disappear. At times, workers are almost nomadic as they trudge across the country trying to find a job which is semi-permanent. As for Governor Walker, I was until recently a Wisconsin resident and have paid attention to Walker’s decisions and actions. He has serious trouble behaving in an ethical way. I don’t say that because we have different beliefs. It is shown in the double talking and back room dealing of his administration. I wish he would argue practical matters directly with his opponents and encourage his supporters to do the same. Instead, we get partisan bickering. So… it won’t be fun for me to see whether Walker knocks it out of the park. That’s politics and public opinion. I’d rather he got down to governing by sound principle and speaking straight. There will still be differences in opinion, but more people will have jobs, and the dialogue will be a heck of a lot better. In the following sentence(one of the last few paragraphs), there is a typo which I bolded here: Look at how we hire help – it’s no so different than how we elect leaders(I believe you meant “not”). I love your messages and agree with most of your opinions including this one. I haven’t been able to reach out to you personally so I guess I will post this here.